The market has taken us on a wild ride over the past few years. Many investors saw their portfolio cut in half, and others...worse. During these times of uncertainty, it makes you want to throw your hands up in the air and call it quits! My service will help you. I have successfully navigated amazing bull markets and crashes by using options to limit my risk and boost my returns-- and I want to pass that knowledge on to you. 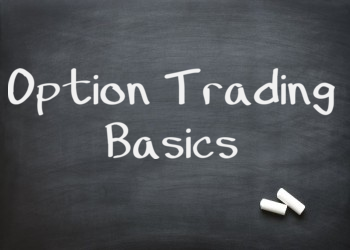 Trading stock options can be a very hard at first, but if mastered it can give you a way to profit in any market environment. 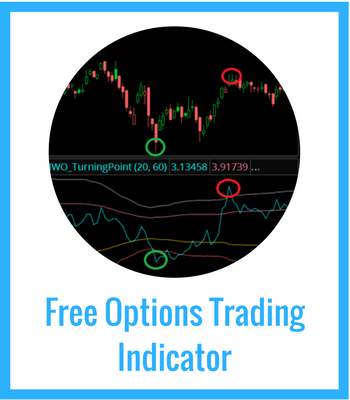 IWO Premium provides you with the education and the trade alert to make you incredibly successful in the options market. Read on about how my service can benefit you. By joining IWO, you will develop an edge in the markets that is an investor's dream. A Model Portfolio. IWO uses a portfolio size of $40,000 to trade. This shows you how to manage risk with position sizing and market hedging. Larger and smaller accounts are welcome, too! Live, Real-time Trade Alerts. Trades are sent to you via email and twitter, so you have the ability to get fills before the market takes off. The trades come with a full post giving the explanation behind the market and the stock or option strategy order in detail. A Premium Twitter Stream. This protected twitter account gives you direct access so you can ask questions about potential or current trades. Shorter term trade ideas are discussed on the stream. Premarket Video. Each night before a trading day, video is posted for you that looks at current market conditions as well as potential trade setups for the next day. Weekly Live, Educational Webinars. Each Wednesday night, the IWO Happy Hour webinar brings subscribers an in-depth look into a particular option strategy or technique. The trade alerts that go out to members are tracked in the IWO Portfolio. This is a model portfolio of $40,000 that we use to show how to properly size your positions given a certain amount of cash. By using a certain size, you can track positions in your own portfolio at the proper scale . This portfolio is tracked very closely, and you can follow all open positions using the portfolio monitoring section of the premium website. Official IWO Premium Trades are designed to be held for a swing. That means you don't have to sit in front of your screen all day, allowing you to trade part-time. Whenever a trade is established, an alert is sent out through several mediums. We have the premium chat room that has instant communication, we have the premium twitter stream, and we have email alerts. That way you are always alerted when a trade is executed in our portfolio. Any official trade comes with the explanation of why we are taking the trade, using technical and quantitative analysis. If the option strategy is complex, the trade will be explained in detail on what contracts to buy or sell. You can also copy the order ticket directly into your thinkorswim trading platform. One of the biggest roadblocks to beginners is the difference between trading stock and trading options. With stock trading, you only have to worry about price-- but with options, it brings in all this math and funny terms like "condor" and "vega." Our trade alerts give you the ability to trade part time, so you don't have to sit in front of a trading screen all day. It can be a little intimidating-- but IWO is the best place to learn about stock options. You will see how trades are formulated and structured, and our weekly educational sessions give you the ability to learn concepts that are not widely known. The educational component of IWO will make you a better options trader. The methods and techniques taught are unique and will be found nowhere else. IWO Subscribers get access to the Premium Chat Room, a private area where subscribers can talk to each other. The InvestingWithOptions premium service has brought in traders from various backgrounds and trading styles. With such a diverse group, it's great to be able to generate ideas in real time. New and current trades from the IWO Portfolio are discussed, and intraday stock and option trades are called out live in the chat room. 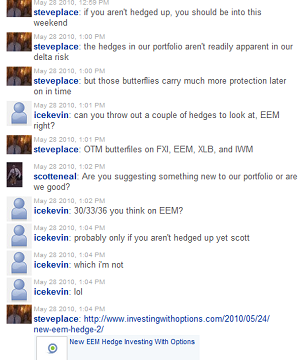 These "unofficial" trades are called out by subscribers as well, and different hedging strategies are discussed. This chat room has been the best addition to the IWO service and the idea flow has been very profitable. The webinar is live and IWO Subscribers are able to ask questions in the chat room. If you are not able to attend Happy Hour, that's not a problem-- the sessions are recorded and available to watch in the Happy Hour Archives. As this gets more and more built out, it will be a very strong knowledge base for you to learn how to trade options the right way. Depending on the market environment, we average 15-20 trades per month. What timeframe do you trade? We focus mainly on the daily charts, but will time our entries on shorter timeframes. We will hold a position between a day to a few months, depending on the strategy. When should I expect trade alerts? The alerts go out immediately after I post the trade in the Premium section. This allows you to get the best fill in the market. What type of option trades do you make? The kind of trade depends on the current market conditions. 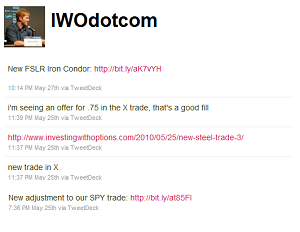 We range from simple call and put buys to more complex strategies like the iron condor. Regardless of the type of trade, the explanation spells out in plain english why we are putting on the trade and why we chose that strategy. How do you manage your risk? We assume that market volatility is a given. We use portfolio hedging strategies, as well as hedging through the option strategies we choose for a particular trade. If you're serious about mastering this market through options, this is the service for you. 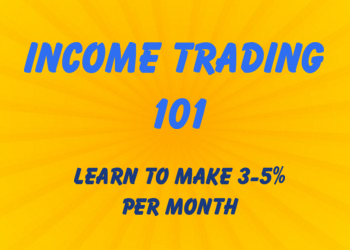 The trades and education you receive for your subscription is unparalleled. The confidence and profits you stand to make will make your IWO Premium service a great investment in your financial future.